Happy new week! I hope you had a wonderful Thanksgiving! Peter came home from college (with 7 loads of laundry in tow!) and it was so nice to have my boy home and a full house again for a few days! I am currently sitting in front of a gorgeous fire at the prettiest Vermont inn, where Mark and I spent the night after taking Peter back to school yesterday. It was an impromptu night away while my mom stayed with our other two munchkins and I’ll share a bit of this beautiful place with you soon! Today I have another fun little project that would be great for your holiday decorating! 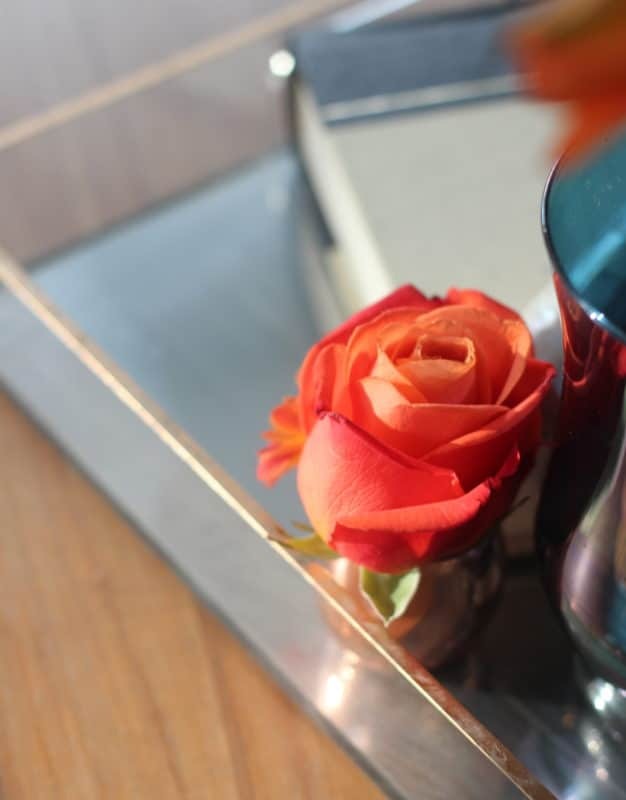 A couple weeks ago I showed you how I zhushed up an acrylic tray by giving it a mirror finish…..
and while I was at it I decided to change up the Ikea Borrby lanterns I’ve had for years. Do you have these too? 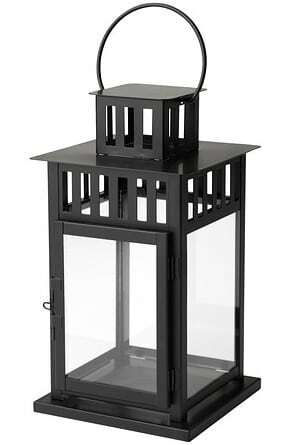 They come in white or black and at $7.99 for an 11″ high lantern, and $14.99 for a 17″, they are pretty affordable. I have three of the smaller size and use them all over the house – holiday tablescapes, our front steps, the mantle, and mostly recently they lived on our deck this summer. Although they have stood up to the elements outside really well, they were super filthy, starting to look rather worn and just begging for a makeover. 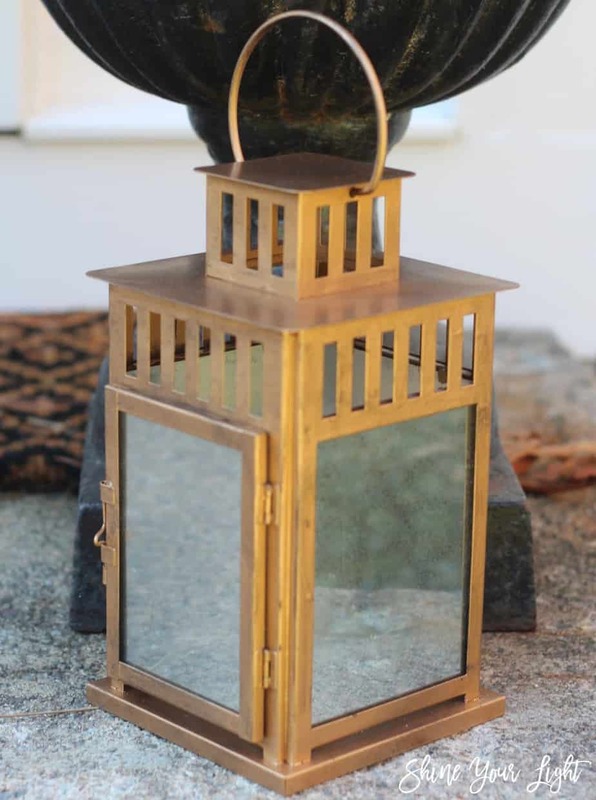 I thought mercury glass would be really pretty with flickering candlelight and while I was at it I gave the lanterns an antique brass finish as well, and really love how they came out! • ONE • Remove the glass. I used a dinner knife to very gently push up the tabs that hold them (a slender flat head screw driver would work here too). 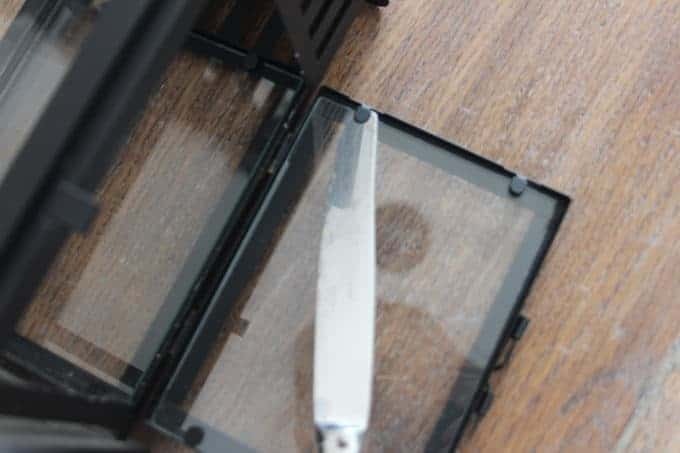 Be careful not to press against the glass when you do this or it will chip. The tabs are pretty stiff and take a little finagling, but I found that by putting the tip of the knife under the tab and my finger on top of it, I could safely and quickly open it. • THREE • Paint the body of the lantern. 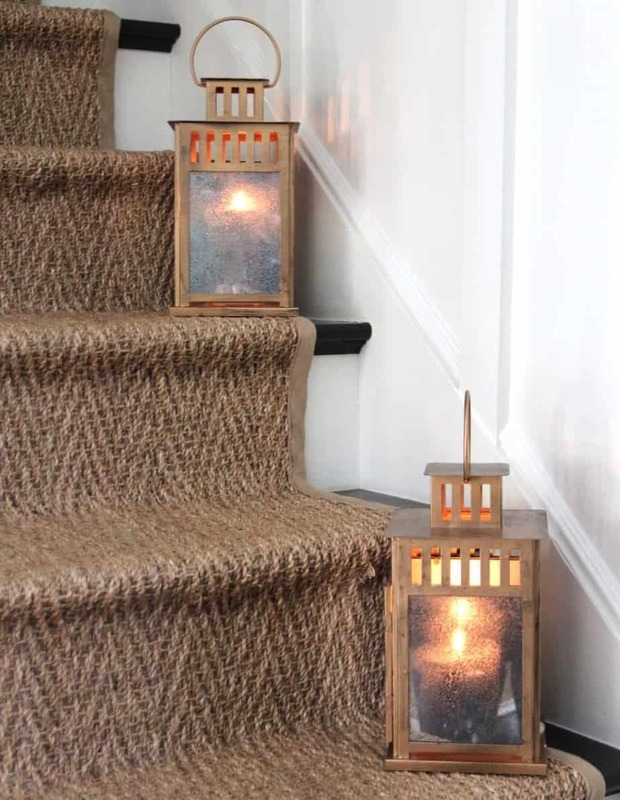 On a tarp, in a well ventilated space, lightly spray paint your lantern 2-3 times, allowing to fully dry between coats (don’t forget to wear a respirator when spray painting!). I like this gold spray paint. If your lanterns are white, the gold shows up a little brighter. To give the gold paint an antique brass finish: dampen a paper towel and then dab a bit of black acrylic paint on it. Wipe onto the lantern. I like to use a “wax on, wax off” method to achieve a slight glaze and knock the solidness of the spray paint down a bit. 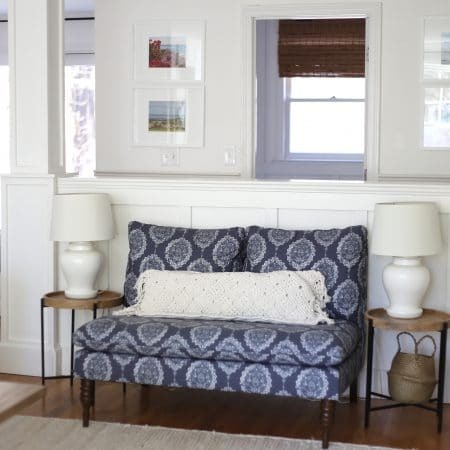 For more details on how to give gold spray painted objects an antique brass finish, check out this post I wrote about my ping pong ball curtain rods. • FOUR • Mirror the glass. Arrange the glass on a tarp in a well ventilated area. 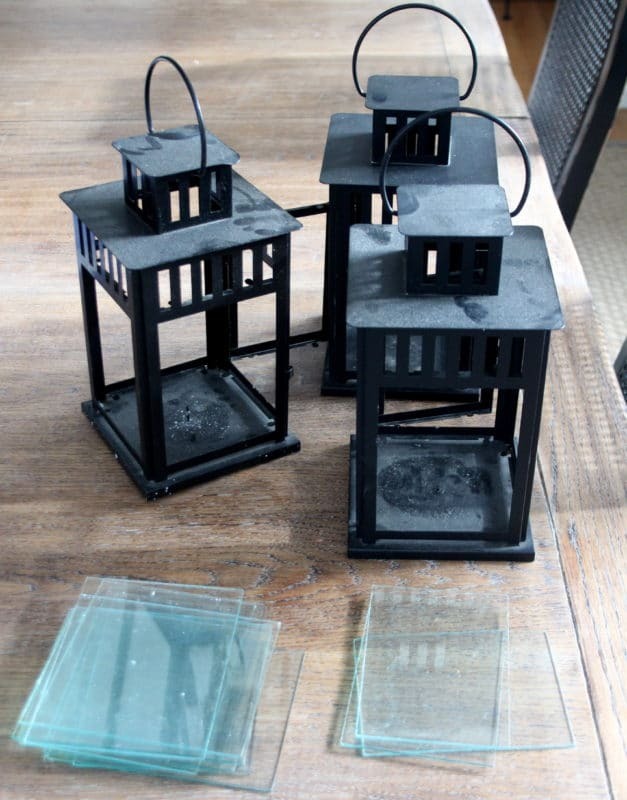 Lightly and evenly spray glass with Looking Glass spray paint, and then immediately mist with the water/vinegar solution. Let dry for 15-20 minutes, then repeat with a coat of spray paint followed by water/vinegar solution. 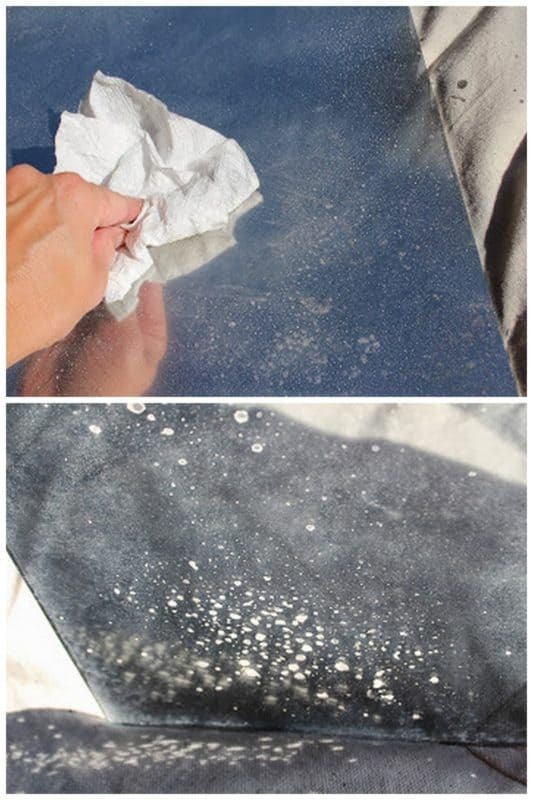 After the second coat is dry, wipe the surface of the glass with a rag. 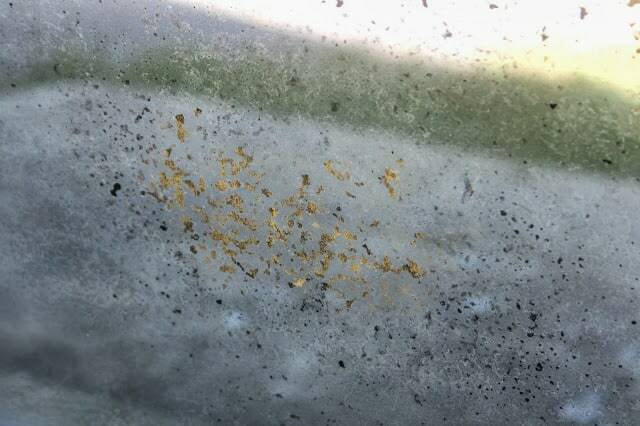 Real mercury glass sometimes has flecks of gold and/or black in it. 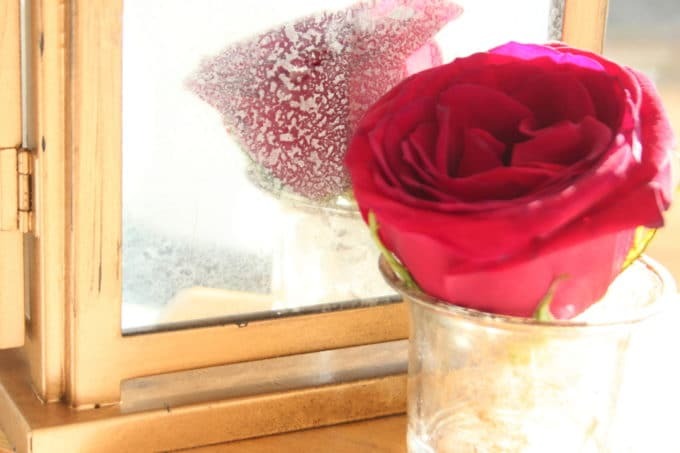 You can add this detail with acrylic paint by putting a bit on a rag and blotting it onto the spots on the glass that the spray paint didn’t adhere too. I did this for my bar cart shelves but skipped it on the lanterns. • FIVE • Return the glass to the lantern. 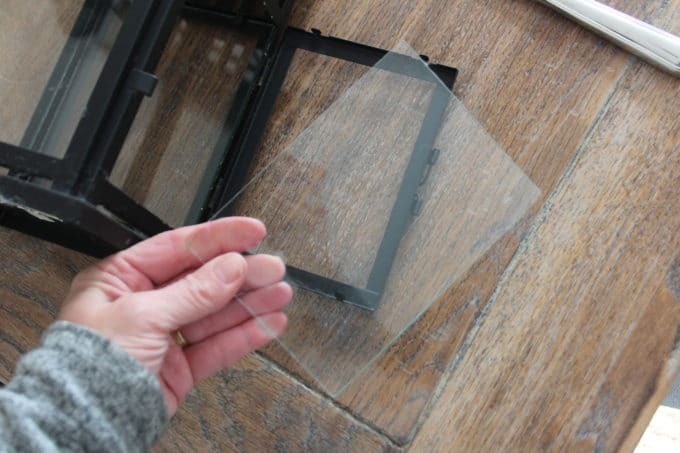 Make sure the sprayed side of the glass faces inward, and take care folding the tabs back down. And then enjoy your new beauties! The mercury glass is very subtle on my lanterns. I am always amazed at the mirror finish from spray paint! It never gets old. TO USE REAL CANDLES OR NOT? Since I first wrote about DIY mercury glass, I’ve had tons of inquiries as to whether it’s safe to use Looking Glass spray paint inside candle holders. While I’m no expert on this subject, I have done a little research into the topic. Do NOT paint in the vicinity of an open flame. Do NOT paint any surface that will be in contact with an open flame, especially the insides. Do NOT leave open flames unattended in any situation. If the paint comes within direct flame contact, it will burn and smoke. While it’s unlikely a real candle flame will come in contact with the glass, to be on the safe side, consider battery operated candles or string lights for lanterns or other candle holders painted with Looking Glass. 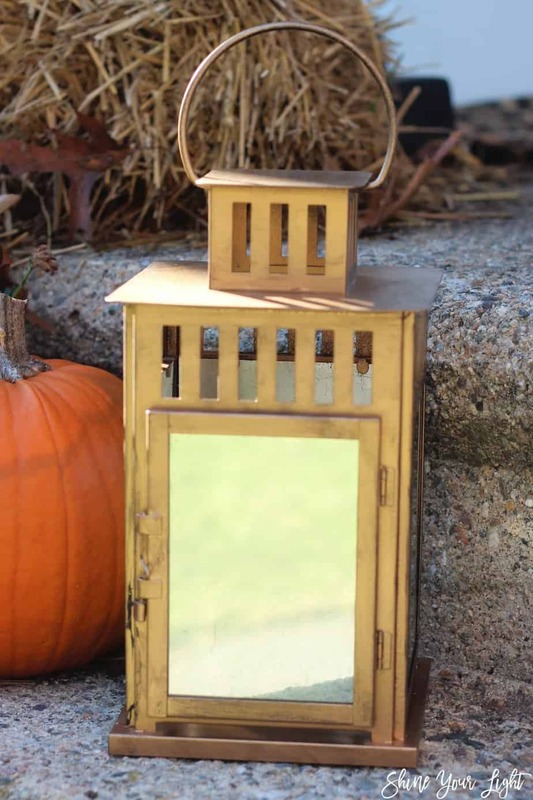 You’ll be seeing these lanterns in my Christmas decorating this year, I love to change things up using what I already have on hand and I’m feeling a lot of gold this year! Have you started decorating for Christmas yet or do you like to ease into it like me? 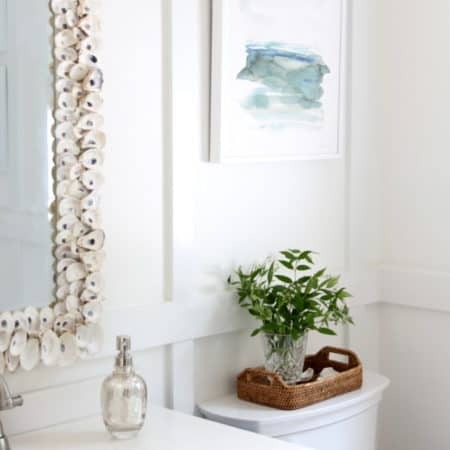 I hope you enjoyed this latest Ikea hack and another way to use the super fun Looking Glass paint. If you haven’t painted anything with it yet give it a try. It’s kind of magical! Girl, you’re a genius! These are fantastic!! Aww thanks my friend! The wonders of spray paint! Wow those lanterns looks great! 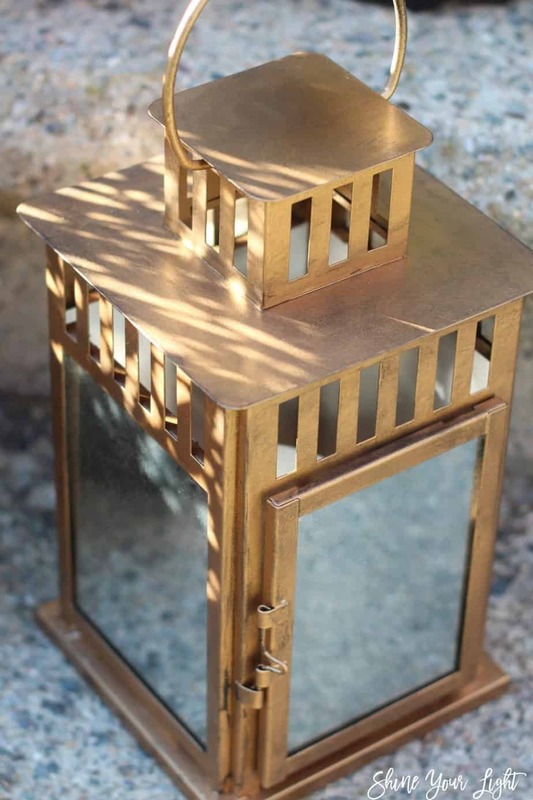 I have used the antiqued mirror effect on several things but need to try it in my lanterns now! Loving the antique brass look too. Isn’t the mirror paint amazing Gina? So fun to use!